Min. Recommended Wheel Base - 38"
Min. Recommended Width - 60"
The skid steer mounted driver allows for greater utilization of one of the most versatile pieces of equipment a fence builder can use. The mount has a unique sideways pivot that adapts to the quick attach plate of that particular model, which permits a 50 degree tilt. Auger System – Uses the driver as mounting hook-up. 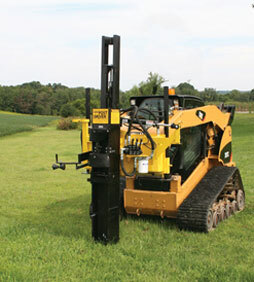 Delivers 10 HP and is used for pilot holes in exteme rough and rocky soils. 4 1/2" diameter. Pressure Auger – Independently mounted along side the post driver, uses the auger system or heavy duty auger as a drive unit. Heavy Duty Auger System – Uses the pressure auger as a mounting hookup. Used to drill holes up to 6 " in diameter in soil and rock.